I was sent a copy of "Geek Girl" to review (I've got 2 copies to give away too!) and in a nutshell it's about a geeky girl who gets a chance to reinvent herself as one of the popular girls! At first I was a bit "oh! What's wrong with being geeky? I was geeky!) but obviously she soon realises the importance of being true to yourself and that there's nothing wrong with geek! The book made me think of all the weird and wonderful phases I went trough as a teenager (my teen years were in the 90's) and I wonder what my little ones will go through as teenagers! I was a bit "grunge" (nirvana was permanently on my cassette player) for a while, and hippie/nature child for ages and my fave was going goth for a full week! I had a long black PVC "the crow" trench coat and doc Martin cherry red boots and full on make up with black hair! Nobody seemed to notice my goth stage and when I was talking about it with my mum recently, she said she thought I'd still been a bit goth up until a few years ago! Anyway, back to the book - a jolly good read and encouraging for any young ladies battling with geekdom, random phases and identity crisis! I thought it was a really good debut novel and would like to read more from Holly Smale. 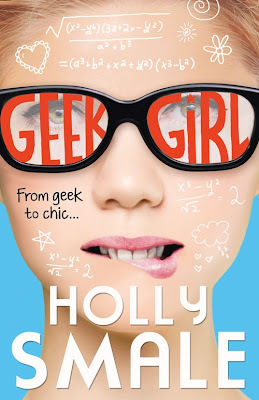 I'm lucky enough to have been offered "Geek Girl" by Holly Smale for 2 of my lovely readers to win a copy each. To enter the competition, please leave a comment below telling me one of your teenage phases! don't forget to include a way for me to contact you if you are the winner, such as twitter id or email please. Competition will close on Thursday 28th March 2013 at 12noon. Two winners will be selected using random.org to win 1 copy each, please reply with your details within 7days of winning or another winner will be selected. Now you're asking. It's so long ago, I'm not sure I can remember. I can remember being into Duran Duran, wearing white kitten heeled stillettos and skin tight jeans for a while. Phases? Haven't ever grown out of them. Thank you to everyone for entering, The competition has now closed. Congratulations to: Olivia280177 and Jenny Leonard. One of my teen phases was only wearing Doctor Martin Boots (purple) to College every day, and my denim jackets.